Wouldn’t you agree that you aren’t leveraging on international customers? A study predicts that Cross border shopping will make up 20 percent of e-commerce in 2022. With the rapid increase in new e-commerce players, it is now essential to gain a competitive edge. However, the question remains as to how? Though you might want to explore the possibilities of acquiring international customers, there stand challenges. How fair is it for your E-commerce company to lose out on potential international customers? The idea of expanding to more than a single territory is a possibility considered by many e-commerce companies. However, the hurdles both internal and external, leave the possibility short-lived for e-commerce companies. Let us take a look at the cross border selling issues. The most common challenge that cross border selling faces is the language barrier. It is crucial to design the website as per the language needs if you are planning to sell across the borders. According to a survey, about 52% of online shoppers prefer buying on sites with their language. Also, 85.3% have agreed that having pre-purchase information in their language is a critical factor in making important buying decisions. Most of the e-commerce websites offer a uniform version of shopping online in English to attract international customers. The next hurdle e-commerce companies face – regulation. There is inconsistency on the regulations. Each country has its own set of regulations for trading. Consider this; if you don’t meet the required regulations of the product you ship, you might face legal trouble. Furthermore, even developed countries like the US are uncertain about the applicability of state taxes on e-commerce transactions. The next dominant share of the challenge is that of a higher price product and shipping cost. Most of the e-commerce companies are clueless as to the terms of pricing. Customers end up paying a higher price and shipping cost. While companies have minimal knowledge of pricing, they also lack insights on how to sell internationally online. Many a time, customers find the same product at a lower price in their country. You need to develop a strong logistics process for your company. Effective logistics has been considered to help companies gain a competitive advantage both online and offline. 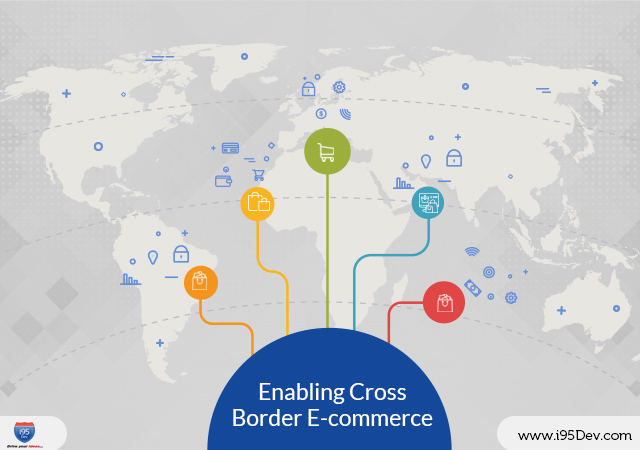 The expenses related to your cross-border logistics can be the tipping point for your e-commerce business. However, it is not just about the costs. It is also about predictability and reliability. E-commerce companies who think their role ends once the product reaches the logistics provider must change. Customers now hold you responsible for ensuring that their order reaches them. Not having organized logistics will increase the complexity in the case of return logistics. Considering the costs incurred, documentation, customs duties and so on, many of the e-commerce companies are not in a situation to provide return option to the cross border customers. Research states that there is 69.2% shopping cart abandonment in the year 2017. People tend to abandon their carts the moment they find the price in a different currency or don’t find the payment option they are looking for. Payment preferences are varied across the world. If you stand uninformed about the payment system in a country, you will be at a loss. For instance, nearly 100% of e-commerce transactions in Spain are by MasterCard, Visa, and American Express. It is about 60% in France and 30% in Germany. In Japan, people use a local payment method that shares about one-sixth of the e-commerce transactions. It is interesting to observe that Asian countries have shown an inclination towards cash on delivery. Accepting the payment method your customer needs is an advantage. If you are an e-commerce player who has crossed the hurdles as mentioned above, the next challenge lies in gaining the trust of your customer. People have their doubts when they buy online on the quality of the product, the payment means and the shipment of the product. Maintaining transparency about the processes and returns and quick response time will help the customer gain trust. Lastly, a question to consider even before the expansion is the profits you’d be making in a given time frame. Investing in new marketing without carrying out proper research can affect your decisions adversely. Often companies overlook the most obvious choices to the ones where true potential lie. In order to choose the right market, companies must profile the countries and determine their potential. The search frequencies analysis can help companies understand the products people are more aligned within a region. We now know the possible difficulties in Cross Border E-commerce. Let us now try understanding how we can overcome these challenges. Your aim as an e-commerce company is to unravel the complexities without losing hold on your business. Read on to know how you can achieve that. The major success lies in optimizing the customer experience by providing your international customers the experience they prefer. As we have seen above, payment plays a significant role in international orders. Zonos Payments helps support about 132 different currencies. The payments are captured in local currency and also offers local payments. Your customers no longer have to feel overwhelmed concerning the currency. One of the most critical factors for customer satisfaction and conversion is providing multiple shipping options at checkout. Most of the e-commerce players lose out on customers on the checkout page as the shipping options are either expensive or limited or don’t match the needs. Customers have no choice but to leave your e-store. How about matching to the expectations of your customers? Customize the options you offer to your customers on checkout. Provide your customers’ price variants and service levels from which they can choose. A report states that 75% of shoppers prefer to buy products in their native language. Though international shoppers can use translation tools, the tools don’t work once they reach the secured checkout page. This again leaves them with indecisiveness and sudden surprise leading to cart abandonment. It is your responsibility to handle this issue for your customers. Provide them a translated checkout for boosting the purchase intent. Zonos localization helps you translate 18 languages for your international customers. Zonos also localizes the address field specific to a country. It dynamically shows only those fields relevant to a country. Zonos Localization API and Zonos Checkout support localizing the address fields to your customer by hiding fields like a postal code field where they do not use postal codes. Also, it will supply correct terminology for that label. Compliance is another barrier to cross border sellers. The protection of consumer data has become essential considering the global retail e-commerce expansion. More than 100 countries around the globe have data protection laws. Zonos can help you manage the cross-border compliance like international taxation, privacy consent and so on. Expanding e-commerce across the borders has become the need of the hour. While we see the cross border selling issues, we have also found a solution to negate these challenges. i95Dev provides a comprehensive set of solutions for improving your Magento e-commerce website. We see Zonos as a complementary product for a more enhanced e-commerce experience. So, are you all set for cross border e-commerce? Know more about i95Dev solutions that will facilitate a smooth walk in expanding your e-commerce website globally.